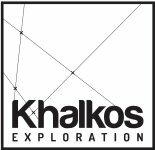 MONTRÉAL, QUÉBEC--(Marketwired - Sept. 26, 2016) - KHALKOS EXPLORATION. ("Khalkos") (TSX VENTURE:KAS) Management of Khalkos is pleased to announce the results of last five drill holes undertaken recently under the auriferous Révillard showing in the Malartic township. Drill hole RV-16-07 (#7), intersected the main shear zone as well as the new high-grade zone Sericite that graded 4.8 g/t Au over 1.5 m including 13.2 g/t Au over 0.5 m. This zone was discovered by drill hole #1 with 4.2 g/t Au over 2 m including 7 g/t Au over 1 m (reference press release August 22, 2016). Drill holes #5 and #6 have also intersected this zone yielding respectively 2.1 g/t Au over 1 m annd 1 g/t Au over 1.2 m. Native gold grains were observed in drill cores and consequently, the ''nugget effect'' was confirmed by gold grades ranging from 1 to 13.2 g/t Au. The low gold grade mineralized enveloppe of the main shear zone was intersected by seven drill holes out of eight of the program with grades ranging from 0.1 and 0.6 g/t Au over widths from 10 to 30 m, including 2.3 g/t Au over 1 m in drill hole #5; along with 5.5 g/t Au over 1 m and 3 g/t Au over 1.5 m in drill holes #3 and #2 respectively. The Sericite zone is located stratigraphically under the main shear Révillard, it is incorporated in sedimentary rocks of Kewagame group. It is strongly altered and contains sphalerite, galena and chalcopyrite, its width ranges from 1 to 3 m.
No significant value was intersected by drill hole RV-16-08. Altogether, eight short drill holes were undertaken under the Révillard showing, for a total of 800 m drilled, confirmed thus its vertical continuity on approximately 50 metres. Following an insurance program and analytical quality control, blank samples and standards were added to collected samples on half drill cores of the Malartic property before being assayed by Actlabs laboratory of Val-d'Or, Québec following the fire assay method. This press release was prepared by Robert Gagnon, President of Khalkos, Qualified Person pursuant to National Instrument 43-101. About this company Khalkos Exploration Inc.